Radiographic evaluation is very helpful in the diagnostic process and cone beam CT technology makes accessibility to low cost, low radiation CT scans. Magnetic resonance imaging (MRI) is one of the best diagnostic tools for identification of TMJ pathology, allowing evaluation of TMJ disc position, morphology, mobility, extent of joint degenerative changes, inflammation, and presence of connective tissue/autoimmune diseases. Importantly it can help in the diagnosis of TMJ pathology in the silent joint where disc displacement and degenerative changes can be present but may not make noise or be particularly uncomfortable or painful but yet result in poor outcomes if only orthognathic surgery is performed. 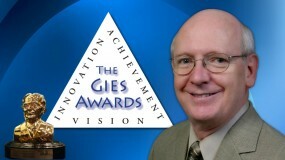 CT scans, bone scans, 3-D imaging, 3-D modeling, etc. may be beneficial for some patients. Magnetic Resonance Imaging (MRI) is one of the most important diagnostic tools that we have in evaluation and diagnoses of TMJ pathology. 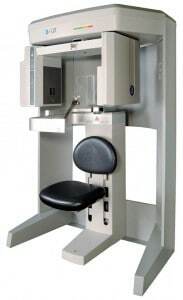 In general, T-1 MRIs are helpful in identifying disc position, the presence of alteration in bone and soft tissue structures structure, and interrelationships of the bony and soft tissue anatomy. T-2 MRIs are more helpful in identifying inflammatory responses in the TMJ. The importance of disc position cannot be over-emphasized. In our study, we evaluated 3 different patient groups that required counter-clockwise rotation and advancement of the maxillomandibular complex. The 3 groups were well matched relative to the amount of advancement at menton of approximately 13 mm in a counter-clockwise direction. Group 1 had healthy TMJ joints with the articular discs in position and had just orthognathic surgery performed. Group 2 had anteriorly displaced articular discs and at surgery these discs were repositioned into a normal relationship with the Mitek anchor technique and concomitant orthognathic surgery performed. Group 3 had anteriorly displaced discs, but only had orthognathic surgery performed. At longest follow-up with an average of 31 months, the average relapse at menton for Group 1 with the healthy joints was 5%, or 0.5 mm for every 10 mm of maxillomandibular counter-clockwise advancement. Group 2, who had displaced discs repositioned with the Mitek anchor technique and orthognathic surgery had an average relapse of 1%, or 0.1 mm per 10 mm of counter-clockwise mandibular advancement. Group 3, had displaced discs where only orthognathic surgery was performed, the average AP relapse was 28% of the amount of advancement or almost 3 mm for every 10 mm of mandibular advancement, indicating post surgical condylar resorption occurring in this group of patients. This study conclusively shows the importance of having the articular discs in position for stability in orthognathic surgery, particularly in patients who require mandibular advancement and specifically for those that require counter-clockwise rotation of the maxillomandibular complex. The counter-clockwise rotation of the maxilla-mandibular complex is a very stable procedure, if the discs are healthy and/or placed into proper anatomical position. In a previous study, we evaluated 25 patients who had bilateral TMJ displaced articular discs and underwent double jaw maxillomandibular advancement surgery, with an average advancement of 9 mm at point B but the TMJs were not addressed so the articular discs remained anteriorly displaced. 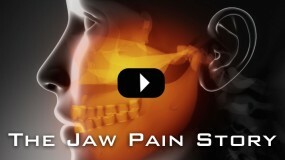 Presurgery, 36% of the patients had pain or discomfort involving the TMJ, head and jaw area. 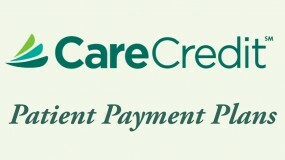 At an average of 2.2 years postsurgery, 84% of the patients had pain. The average pain at longest follow-up increased 70% in intensity over the presurgical pain level. In addition, 30% of the patients developed significant mandibular A-P relapse and developed open bites. This study also demonstrates the adverse effect of performing orthognathic surgery on patients with displaced TMJ articular discs. With a normal healthy condyle the condyle should have a uniform shape and consistent thickness of cortical bone. The condyle should be positioned in the fossa with equal joint space between the condyle and fossa posteriorly, superiorly, and anteriorly. The articular disc should sit on top of the condyle with the posterior band being about the 12 o’clock position. The disc should have a bowtie shape with increased thickness of the posterior band and anterior band and a thinner area for the intermediate zone. The articular eminence should have a moderate inclination, although the articular eminence may be quite variable in its steepness, which in some cases can contribute or predispose certain TMJ conditions. The MRI imaging can be correlated to cone beam imaging of the TMJs for joint space and greater interpretation of bony pathology. FIGURE 12: A) Normal TMJ with posterior band of disc at 12:00. B) On opening the condyle and disc translate down and forward beneath the articular eminence. 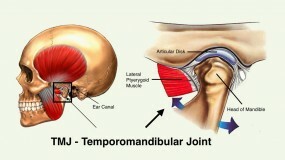 Figure 12 demonstrates the sagittal view of a normal and healthy TMJ. On opening, there should be good translation of the condyle and the articular disc forward and positioned beneath the articular eminence. The most common type of disc displacement is anterior as seen in Figure 13. The posterior band of the disc is anterior to the condylar head. When opening, the disc may or may not reduce. 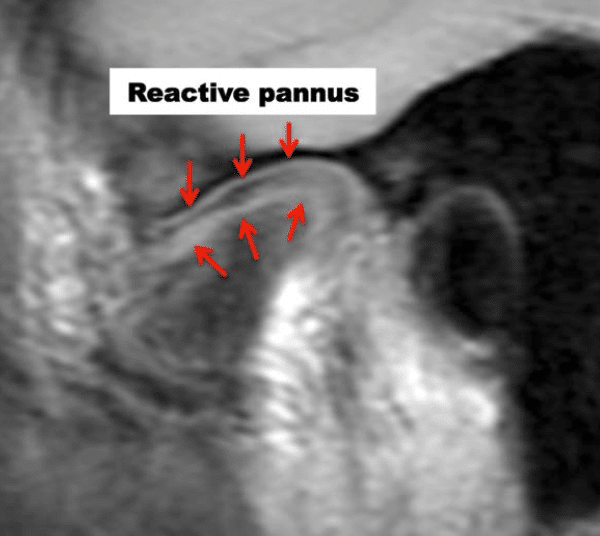 Upon reduction, there is usually a palpable and sometimes audible pop in the joint as the head of the condyle comes downward and forward over the back end of the posterior band with the condyle reducing onto the disc. The mandible may then open the rest of the way with a normal condyle-disc position. Upon closing, the condyle may slide back off the posterior band of the disc, making a reciprocal click. As TMJ disease progresses, on opening the disc may not reduce back in position creating a silent joint, as the disc remains anterior throughout jaw function. Displacement of the articular disc can initiate a cascade of events leading to arthritis. FIGURE 13: A) In closed position, the condyle is positioned posterior in the fossa and the disc is anteriorly displaced. B) On opening the disc reduces into a normal position. The anteriorly displaced disc may eventually become adherent to the articular eminence limiting the translatory abilities of the condyle and disc creating the “closed lock” phenomenon (Figure 14.A). It is not uncommon to see a lateral rotational disc displacement where the disc may be anteriorly displaced at the lateral aspect of the joint, but towards the medial, the disc is in normal position, thus the importance of the evaluation of sagittal views from lateral to medial in a sequential fashion (Figure 14). Since the lateral attachment of the disc is weaker compared to the medial pole attachment, the disc more commonly will displace at the lateral aspect of the joint initially and then progress towards the medial side. This also can cause the disc to displace medially so the disc becomes anteromedially displaced. 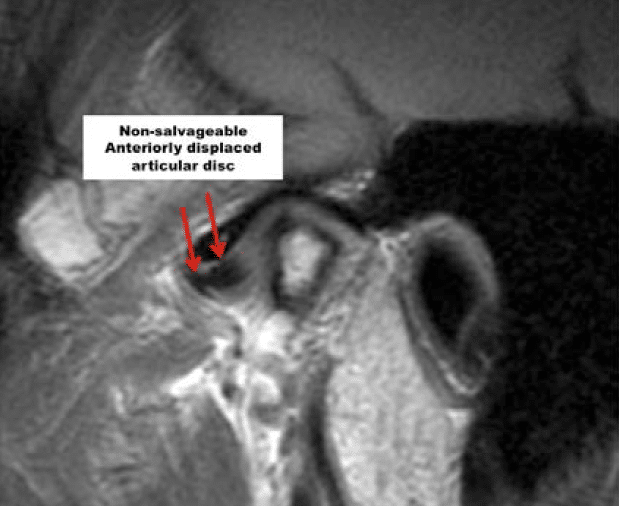 FIGURE 14: A) Sagittal view of anteriorly displaced disc, B) In this coronal view the articular disc is laterally displaced. C) In this coronal view the disc is medially displaced. Posterior displacement of the articular disc is much less common than any other form of disc displacement (Figure 16). This occurs usually only in patients with condylar hyperplasia type 1, where the condyle is growing in length at a faster rate than the normal upward migration of the posterior ligament attachment, thus, pulling the disc posterior to the condyle. When discs are anteriorly displaced for an extended time period, the discs may become deformed with loss of the intermediate zone and thickening of the posterior and anterior bands (Figure 15). Also, there may be a degenerative process developing in the discs where there is a breakdown of the cartilaginous substance with vascular invasion and degeneration. When discs advance to a certain level of deformation and degeneration, they become non-salvageable. When discs are displaced and non-reducing the degenerative process of the disc progresses more rapidly as compared to displaced discs that reduce. Observing information from the MRI will help determine which corrective surgical procedures will provide the best and most predictable outcome. FIGURE 15: The articular disc is anteriorly displaced and significantly deformed, degenerated, and non- reducing rendering it non-salvageable. 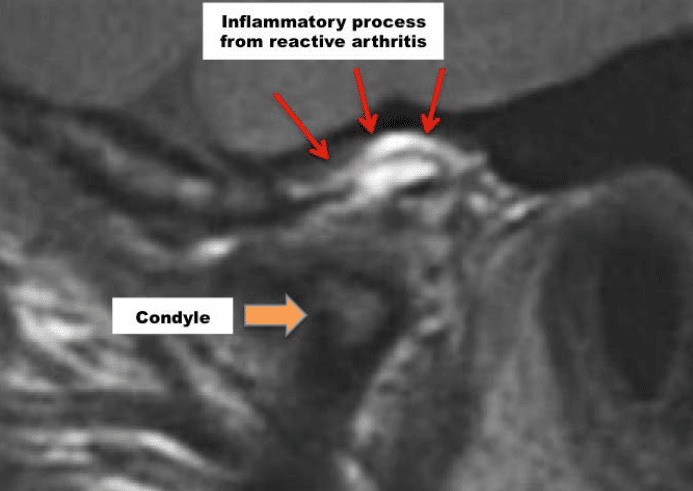 FIGURE 16: In this case of condylar hyperplasia Type 1, the condyle is growing vertically at an accelerated rate that is faster than the posterior ligament attachment can migrate upward, thus pulling the disc posterior to the condyle. The MRI presentation of connective tissue/autoimmune diseases is fairly pathognomonic. In these conditions, the articular disc oftentimes is in the normal position, but there is progressive condylar resorption and often resorption of the articular eminence, with slow but progressive destruction of the articular disc, which is surrounded by a reactive pannus (Figure 17). This presentation almost always indicates the requirement of a total joint prostheses for jaw reconstruction to eliminate the pathologic process in the joint. Use of autogenous tissues in this scenario could result in the disease process attacking autogenous tissues placed into the joint with subsequent failure. FIGURE 17: Common TMJ changes in connective tissue / autoimmune disease. The disc is in position but with a reactive pannus (grey tissue) surrounding the disc that destroys the disc, condyle, and articular eminence. There are a number of TMJ pathological processes where the disc is displaced, but yet the disc is silent with function. These situations include: a steep articular eminence where the articular disc is anteriorly displaced, but in a vertical orientation so that upon opening there is an immediate reduction of the disc as it is in a “pre-click” position. Medial and lateral displacements of the disc may create pain and dysfunction, but the joints may be silent since there is no reduction over the posterior band. This also goes along with posterior displaced discs where the TMJs may make no noise, but could contribute to pain and discomfort. Certain pathological conditions such as AICR (Adolescent Internal Condylar Resorption) where there may be thickening of the bilaminar tissues so that there is a smooth transition from the thickened bilaminar tissue onto the disc, thus no noise is made. Also in patients who have anteriorly displaced discs without reduction may have no noises. Patients who have been in long-term splint therapy with downward and forward posturing of the mandible may create thickening of the bilaminar tissues so that there is a smooth transition onto the disc. 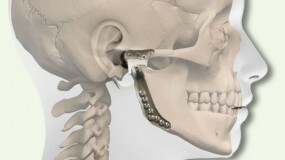 Any Class II mechanics may artificially pull the condyle down and forward onto the disc, but this may be an unstable position that the surgeon must be aware of and understand that orthognathic surgeries performed with advancement of the mandible, will likely position the condyle into a centric relation post surgery and the disc will again be anteriorly displaced. Adolescent internal condylar resorption (AICR) has a relatively classic presentation. This condition develops usually between the ages of 11 to 15 years, predominantly in females (ratio 8:1 females to males). Clinically, the mandible will be noted to slowly retrude into a Class II occlusal and skeletal relationship with a tendency towards anterior open bite. These patients all have high occlusal plane angle facial morphological profiles. However, on the MRI, these cases present with a condyle that may be slowly becoming smaller in size in all 3 planes of space. In some cases, there is significant thinning of the cortical bone on top of the condyle contributing to the inward collapse of the condylar head in this pathological process. The articular discs are anteriorly displaced and may or may not reduce on opening. Non-reducing discs will degenerate and deform at a more rapid rate as compared to a disc that reduces. Our studies demonstrate that AICR is arrested if the articular discs are put back into position on top of the condyle and stabilized with the Mitek anchor technique. 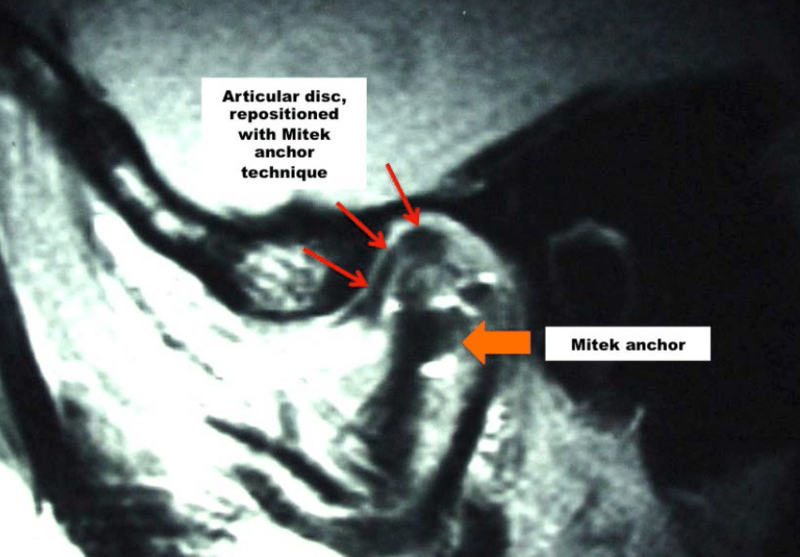 Post surgical view of a repositioned disc with a Mitek anchor is seen in (Figure 18). There is some distortion of the MRI imaging because of the metal anchor in the head of the condyle but the reduced position of the disc is noted. Results are best for AICR if the TMJ surgery is performed within 4 years of the onset of the pathology. After 4 years, the discs may not be salvageable and the indicated treatment may then be custom-fitted total joint prostheses to repair the TMJs and advance the mandible. 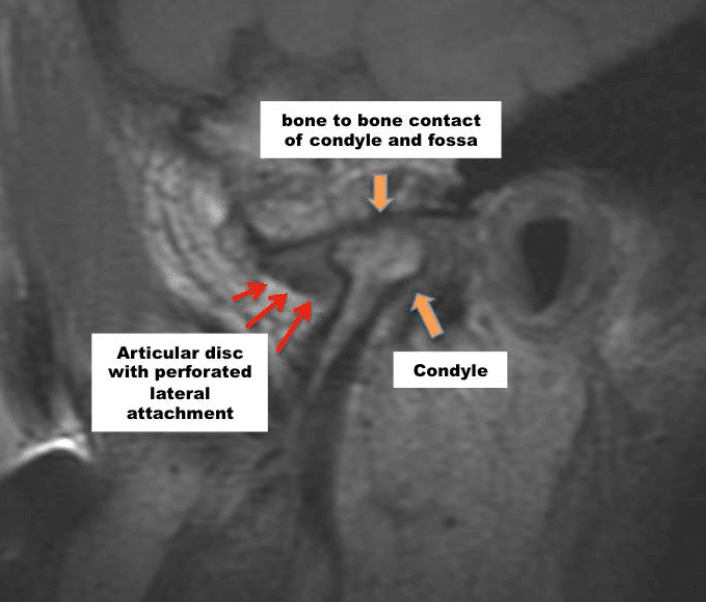 FIGURE 18: MRI demonstrates a repositioned articular disc using the Mitek anchor technique, with the disc in a normal position. Osteochondroma (CH Type 2) will usually present as an enlarged condyle with either extended exophytic growth off the condylar head (Figure 19) versus increased vertical dimension of the condylar head. This condition is a unilateral TMJ pathological process and the articular disc is commonly in position, even in the presence of large exophytic pathological growth processes present. However, importantly, in cases with CH type 2, often the contralateral “normal” joint may be overloaded, developing an anteriorly displaced disc and subsequently arthritic changes which occurs in about 75% of the cases with a unilateral CH type 2. The indicated treatment includes a low condylectomy for removal of the tumor, recontouring of the condylar neck to form a new condyle, and repositioning of the articular disc, as long as the disc is salvageable, with a Mitek anchor technique, and the recontoured ipsilateral condylar neck will then function as a new condyle. 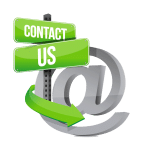 The required orthognathic surgery procedure can be done concomitantly. 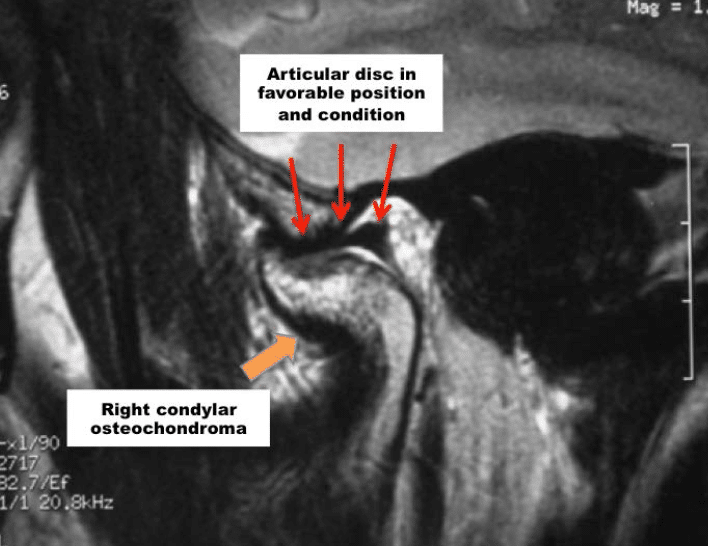 FIGURE 19: MRI of right TMJ shows osteochondroma with large exophytic growth of the anterior aspect of the condyle (CH Type 2Ah). The articular disc is in favorable position and salvageable. Reactive arthritis may show a localized area of inflammation with erosion of the condyle and/or fossa. It also can present as a more profuse inflammatory process through the bilaminar tissues, capsule (Figure 20), etc. Surgical indication may be to go in and remove the nidus of inflammation versus extensive destruction of the joint that may require a total joint prosthesis. 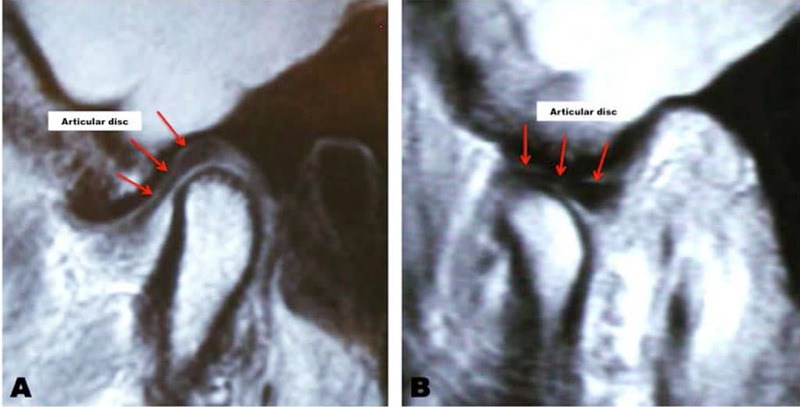 FIGURE 20: T2 MRI of right TMJ with reactive arthritis and significant condylar resorption. The inflammatory process is noted to occupy a significant volume between the fossa and condyle. Perforations can occur in the TMJ area resulting in bone-on-bone contact. For perforations the discs are usually displaced. Almost always these perforations are posterior to the posterior band of the articular disc or lateral to the disc and rarely do perforations occur through the disc itself. (Figure 21) Relative to the condyle, perforations can occur in the middle, medially or laterally. Clinically, crepitation will usually be present and, on the MRI, there will be evidence of bone-on-bone contact and usually arthritic evidence on the condylar head and/or fossa. 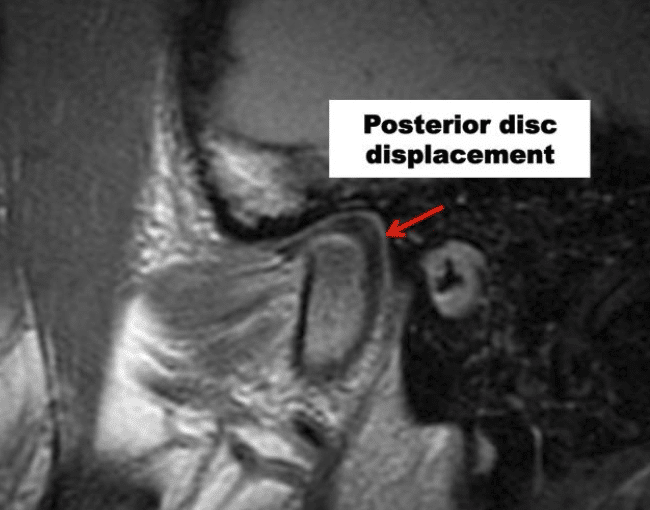 FIGURE 21: MRI of left condyle with perforation of the bilaminar tissue posterior to the anterior disc. Bone to bone contact of condyle and fossa is observed with crepitation on jaw function. The development of cystic formations within the joint has a fairly classic appearance where there is a large collection of fluid within the joint spaces (figure 22). The indicated treatment would be removal of the cystic formations and, if the disc is salvageable, reposition the disc. 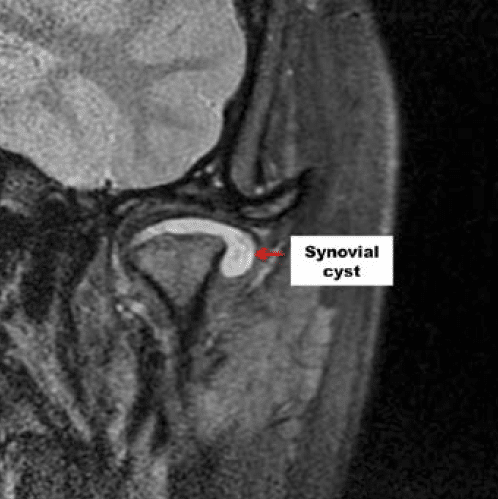 FIGURE 22: Coronal view showing a synovial cyst overlying the superior and lateral aspect of the condyle.